Harbor deepening market in Japan has taken a significant upswing on account of increasing foreign trade. Japan’s seaborne vehicle shipping and container shipping are other factors driving the growth of APAC harbor deepening market. Recently, Singapore and Japan have declared a joint feasibility analysis for promoting LNG bunkering, benefitting the car carriers operating between the two countries. That said, Japan is expected to display lucrative growth avenues for the harbor deepening market in the near future. Immense efforts are being taken up by JICA (Japan International Cooperation Agency) in entering into an agreement with Cambodia government in Tokyo for the purpose of expanding Sihanoukville Port, thereby creating growth opportunities for harbor deepening market. The project is expected to double up the handling capability at the deepwater port at Cambodia with improved cargo handling and new container terminal for boosting trade. This in turn creates higher growth avenues for harbor deepening market in the near future. The governments of Hong Kong are taking immense efforts in attracting mega-container ships by taking up harbor deepening projects on a larger basis. Major deepwater ports on East coast of India are planning to make heavy investments in research and development for finding unique techniques, in order to maximize the capacity of their inner harbor, thereby creating lucrative growth avenues for harbor deepening market in the near future. Key players and manufacturers in Asia-Pacific region are catering to the increasing demands of the existing as well as emerging customers for optimizing berthing facilities in inner harbor for improving port capacities. Fact.MR has forecasted that harbor deepening market is likely to expand at 3% CAGR over the assessment period, 2018-2028. The key players in harbor deepening market are majorly concentrated in Europe. However, they function in the international waters and major projects of the key players are in Middle-East owing to consistent demand from oil and gas sector. United States is likely to continue dominating North American region, while rising harbor deepening projects have been undertaken and funded by U.S. government. 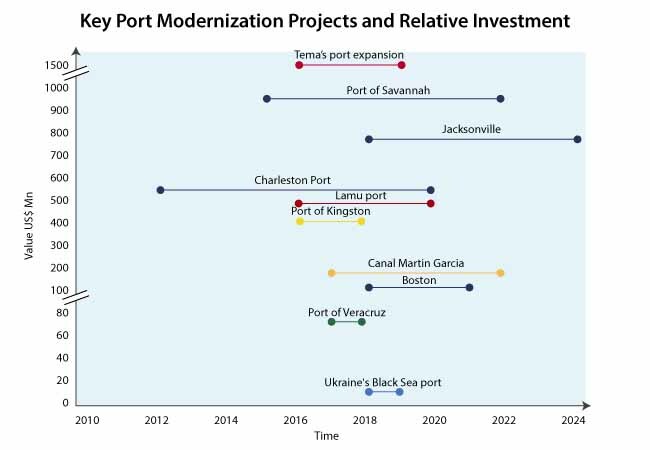 In addition, harbor deepening of the ports in U.S. are backed by increasing number of oil exports. With trade preservation, urban development coastal safety activity has been contributing significantly towards the growth of harbor deepening market. With regards to freight logistics, Germany has an upper-hold in the EU. Harbor deepening scenario across United Kingdom is considered as a significant one, owing to rising harbor redevelopment projects. Seaborne trade has been gaining high importance based on the economic growth of a country and government organizations are investing largely in the harbor deepening activities across the globe, says Fact.MR. A spurt in infrastructure activities across the globe has driven the need for maintenance and expansion of existing harbor and the development of new one. Rapidly increasing population has led to growing demand for huge cargo, thereby paving ways for expansion of docking space on harbor and port. However, high-costs related to harbor deepening have been posing significant challenges for the growth of harbor deepening market.